In 1980 the local Council approved plans for building chambers at the rear of the Thorngate Hall for the purpose of installing the Compton organ from the Regal, Hammersmith. 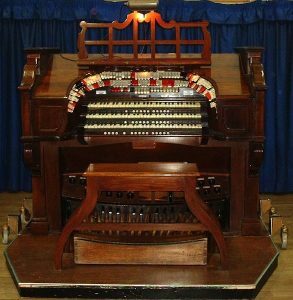 However, before this one could be installed, the larger 13-rank Compton, originally installed in the Gaumont Palace, Wood Green was obtained by the Gosport and District Organ Club and the Hammersmith organ sold. The Compton had been opened in the Gaumont Palace on 26 March 1934 by Frederic Bayco. It was sold for £300 in 1966 to Twickenham College of Technology and was first heard there in 1969. In 1980 it was moved to Gosport and opened on Sunday 26 April 1981 by John Mann. A Kinura and Trumpet were added in 1985 and it is believed to be the only surviving Compton organ with electro-pneumatic action. The whole instrument is totally enclosed within two separate purpose built chambers known as the Solo & Accompaniment chambers and the sound is projected from the back of the stage into the Ballroom through shutters. The blowing equipment is contained in a separate soundproof room, and consists of a series of fans driven by a seven h.p. three-phase motor which also drives a fifteen volt d.c. generator supplying current for the organ’s action.toe pistons and eight hundred insulated wires in the multi-cable between console and organ.